I am totally in a food rut. It’s super frustrating, and I’m probably just being a whiny pregnant lady, but this week I felt very aimless about food with NO CLUE what to make for dinner. I’m bored. I’m tired. I’m spoiled because Whole Foods is right down the street—but we’re moving next weekend and I’m going to have to plan ahead more. We have one car and Dave needs it to drive to work. No complaints here–I’ll be out walking at the beach everyday instead of dodging college students and homeless people and pollution in the city. BUT, I will have to be more organized about food. I’m trying to keep things really simple and also work around my current pregnancy-induced hatred of chicken. Last night’s solution to that was salad. The problem with salad in my house is that (1) I don’t like it unless the lettuce is small and there’s not too much of it, and (2) Dave doesn’t eat salad if he doesn’t love it (and I haven’t figured out exactly what the terms are for that yet). We do seem to like the chopped versions of salads best (small pieces, everything coated in dressing). And we like meat mixed in (if the meat is hot, that’s a bonus–but I may have overdone taco salad here in the past month). 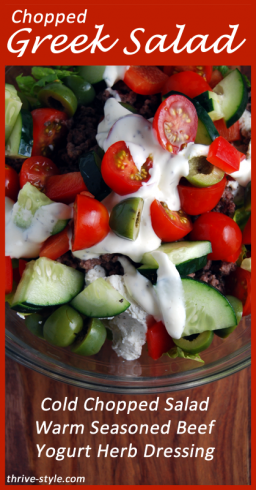 Enter: Greek-ish Salad with improvised meat (no chicken!) and improvised dressing (Whole Foods was out of fresh dill). Directions: add lettuce to a large bowl and chop with a mezzaluna, or dump it onto a cutting board and chop it with a large knife. 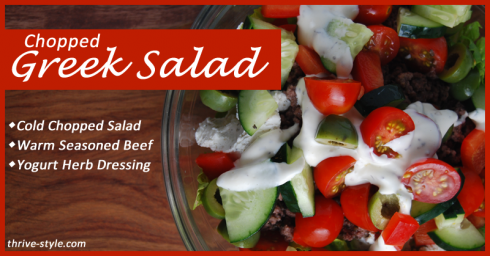 Once chopped and in a large bowl, add all the other ingredients and the dressing. Stir the entire salad to mix all the ingredients well and to coat it evenly with dressing (the pics on this post are pre-stirring! It’s not pretty once you coat it…). Directions: Saute until cooked thoroughly. Taste it and add more salt if it is bland–enough salt will bring out the other herb flavors. Also note, you can use fresh herbs–I would have if we had them available! Just double the amounts of each herb you use the fresh version of (or add more–that would be good too!). Directions: Mix well, add to salad. This is very simple, but it also fit the bill for Dinner in our house. We both loved it, and I’m just glad I wrote it down so I can recreate it later! Previous post: Pregnancy Tip: The Superfood that Gives Your Energy Back!